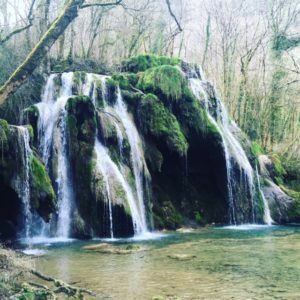 About an hours drive or 100km east of Beaune is the Jura region. This region is famous for two things, yellow wine or Vin Jaune and Comté cheese! 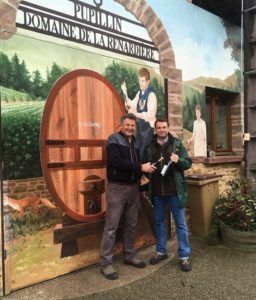 It was a grey, drizzly and windy day when we drove from Arbois to the nearby hamlet of Pupillin to meet Jean-Michel Petit of Domaine de la Renardiere. Jean-Michel began making wine in 1990 and now has around 7.5 hectares of vineyards. The business is very much a family affair and is kept to a size where quality and hands-on winemaking are the key to their philosophy, which includes being certified organic, practicing biodynamic and using as little sulphur in the winemaking process as possible. The two main wine styles in the Jura for table wines are ‘sous voile’ or ‘ouillé’. Sous voile is a traditional winemaking technique and refers to the layer a dead yeast cells that are allowed to form on top of the wine while it is aging in barrel and allows a nutty character to develop. It’s a similar process to the “Flor” that forms in barrels of sherry. The extreme of this style is Vin Jaune and Chateau Chalon where the wines spend at least 6 years and 3 months sous voile and are bottled in the special 62cl Clayvin. These wines are an ideal match to the locally produced Comté cheese and some walnuts. Today, more and more growers are experimenting with the more modern ouillé or topped up style. This describes how the wine is topped up in the barrel to stop any yeast layer forming on top of the wine. 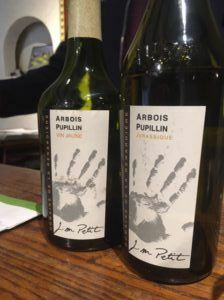 As a result the wine has less or very limited exposure to oxygen and therefore tends to be a more conventional in style, showing less oxidative and nutty notes. It’s worth bearing in mind that there is no official definition of ouillé and some growers top up more religiously than others. This means there can be quite a lot of variation is style so it pays to know the grower or ask your wine merchant! At Domaine Renardiere they make both sous voile and ouillé whites, reds and of course Vin Jaune as well as other local specialities such as Mac Vin and Cremant. Leo, Jean-Michel’s son also runs a craft brewery in Pupillin called Jurassic, and is well worth searching out. The 2016 vintage was extremely popular in the run up to Christmas, so we were excited to try how the 2017 compared. This is the earlier drinking 100% Chardonnay cuvée that is made in the ouille style. Vines grow on red marl/limestone from various sites around Pupillin. The wine is aged in mainly old barrels and left there until the next vintage comes in. We had heard that 2017 was a difficult year but we were still shocked to hear Jean-Michel explain that they lost 70% of their crop due to a big frost in April. Despite this, with careful selection the wine is still delicious with floral notes and almonds, and a mineral lengthy finish. This wine was quite different to the Jurassique, with vines grown on gravel over marl soil. The vines are also much older and most of the barrels are old. Very Burgundian in style with expressive fruit and a touch of toasted nuts and minerality. This is ouillé Savagnin with the wine spending 15 months in barrel. I really enjoyed this wine, and love the trademark Savagnin citrus notes and streak of acidity. Pair this to rich local dishes like Poulet au Vin Jaune. Although Ploussard is a very thin skinned grape, on the nose and palate the wine is bursting with flavour. It has a perfumed nose, cherry and wild strawberry particularly, fresh crunchy tannins. Beautifully elegant and pure. The tiny amount of 2017 that was produced because of the aforementioned frost is all being bottled in magnums. The good news is 2018 is looking excellent for both quality and quantity. Savignin 2013 48 months Sous Voile (instock £32.00) This had sold out at the domaine but will be available as part of our tasting flight on Saturday 6th April. Jean-Michel’s Vin Jaune spends 7 years sous voille, fermentation happens in stainless steel but the wine then goes into barrel. Several years of selecting the best wine with the absolute best selection that will age going into the Vin Jaune. Although quite young for a Vin Jaune, this was immediately appealing on the nose and had notes of walnuts, dried fruit and zesty citrus notes. The perfect partner to the regions speciality comté cheese, also chicken with morels and cream. We highly recommend the Jura region as a fantastic region to visit for the wine enthusiast. The main draw for us is of course the wines and the passionate vignerons that you can visit and taste with, but the food of the region is also amazing! Pair that with the beautiful countryside that is crisscrossed with walking routes that you could spend days exploring on and it makes for a very enjoyable holiday destination.